Internet of Things (IoT) sensors and devices are expected to exceed mobile phones as the largest category of connected devices in 2018, growing at a 23% compound annual growth rate (CAGR) from 2015 to 2021. By 2021 there will be 9B mobile subscriptions, 7.7B mobile broadband subscriptions, and 6.3B smartphone subscriptions. Worldwide smartphone subscriptions will grow at a 10.6% CAGR from 2015 to 2012 with Asia/Pacific (APAC) gaining 1.7B new subscribers alone. These and other insights are from the 2016 Ericcson Mobility Report (PDF, no opt-in). 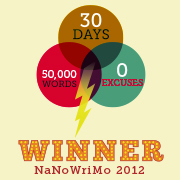 Ericcson has provided a summary of the findings and a series of interactive graphics here. Ericcson created the subscription and traffic forecast baseline this analysis is based on using historical data from a variety of internal and external sources. Ericcson also validated trending analysis through the use of their planning models. Future development is estimated based on macroeconomic trends, user trends (researched by Ericsson ConsumerLab), market maturity, technology development expectations and documents such as industry analyst reports, on a national or regional level, together with internal assumptions and analysis.In addition, Ericsson regularly performs traffic measurements in over 100 live networks in all major regions of the world. For additional details on the methodology, please see page 30 of the study. Internet of Things (IoT) sensors and devices are expected to exceed mobile phones as the largest category of connected devices in 2018, growing at a 23% compound annual growth rate (CAGR) from 2015 to 2021. 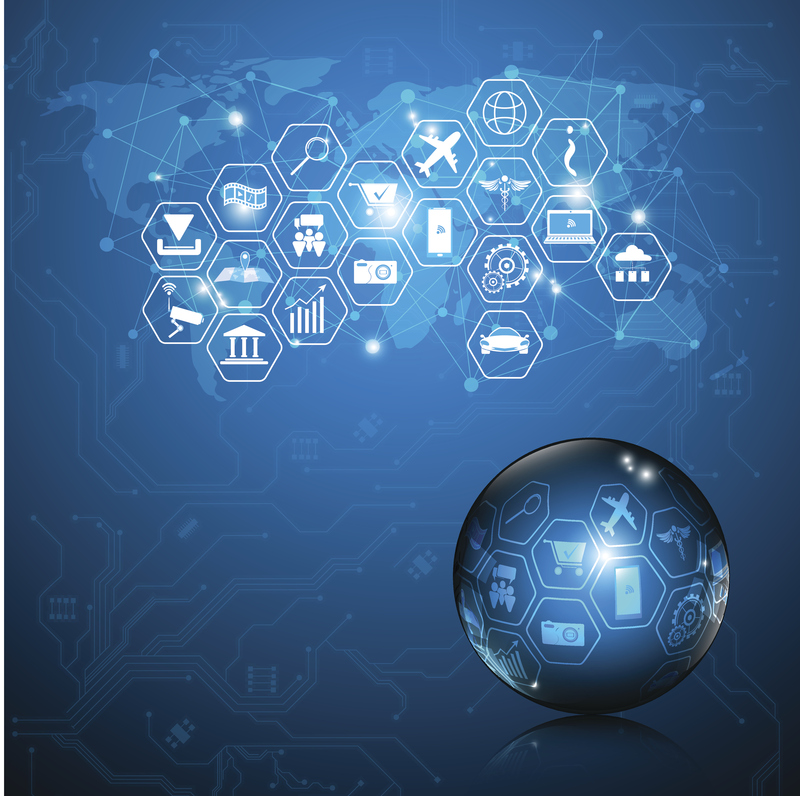 Ericcson predicts there will be a total of approximately 28B connected devices worldwide by 2021, with nearly 16B related to IoT. The following graphic compares cellular IoT, non-cellular IoT, PC/laptop/tablet, mobile phones, and fixed phones connected devices growth from 2015 to 2021. Global mobile broadband subscriptions will reach 7.7B by 2021, accounting for 85% of all subscriptions. Ericcson is predicting there will be 9B mobile subscriptions, 7.7B mobile broadband subscriptions, and 6.3B smartphone subscriptions by 2021 as well. The following graphic compares mobile subscriptions, mobile broadband, mobile subscribers, fixed broadband subscriptions, and mobile CPs, tablets and mobile routers’ subscription growth. Worldwide smartphone subscriptions will grow at a 10.6% compound annual growth rate (CAGR) from 2015 to 2012. Ericcson predicts that the Asia/Pacific (APAC) region will gain 1.7B new subscribers. The Middle East and Africa will have smartphone subscription rates will increase more than 200% between 2015–2021. The following graphic compares growth by global region. Mobile subscriptions are growing around 3% year-over-year globally and reached 7.4B in Q1 2016. India is the fastest growing market regarding net additions during the quarter (+21 million), followed by Myanmar (+5 million), Indonesia, (+5 million), the US (+3 million) and Pakistan (+3 million). The following graphic compares mobile subscription growth by global region for Q1, 2016. 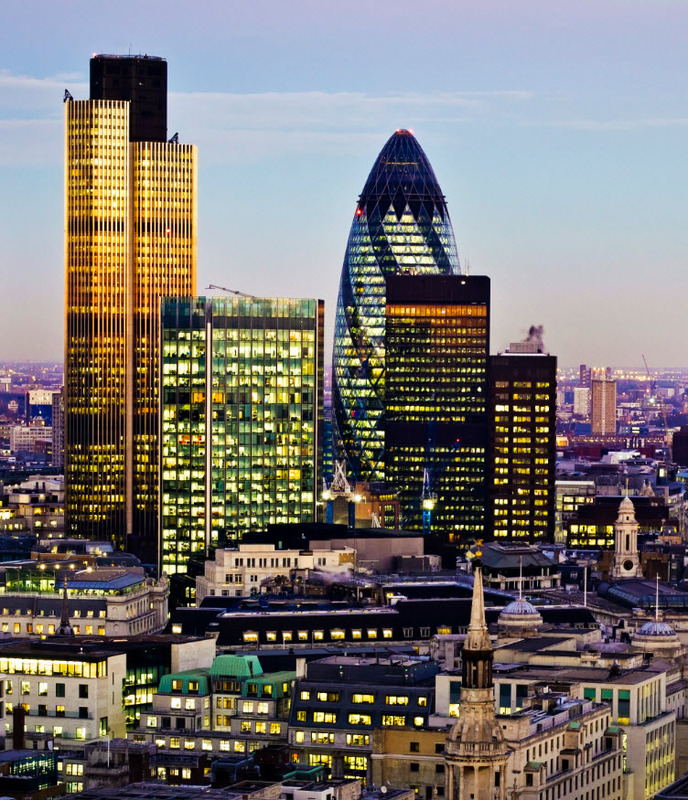 90% of subscriptions in Western Europe and 95% in North America will be for LTE/5G by 2021. The Middle East and Africa will see a dramatic shift from 2G to a market where almost 80% of subscriptions will be for 3G/4G. The following graphic compares mobile subscriptions by region and technology. Mobile video traffic is forecast to grow by around 55% annually through 2021, accounting for nearly 67% of all mobile data traffic. Social networking traffic is predicted to attain a 41% CAGR from 2015 to 2021. The following graphic compared the growth of mobile traffic by application category and projected mobile traffic by application category per month. 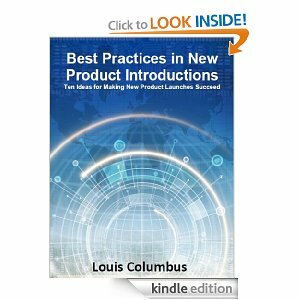 Customers are quickly reinventing how they choose to learn about new products, keep current on existing ones, and stay loyal to those brands they most value. The best-run companies are all over this, orchestrating their IT strategies to be as responsive as possible. The luxury of long technology evaluation cycles, introspective analysis of systems, and long deployment timeframes are giving way to rapid deployments and systems designed for accuracy and speed. 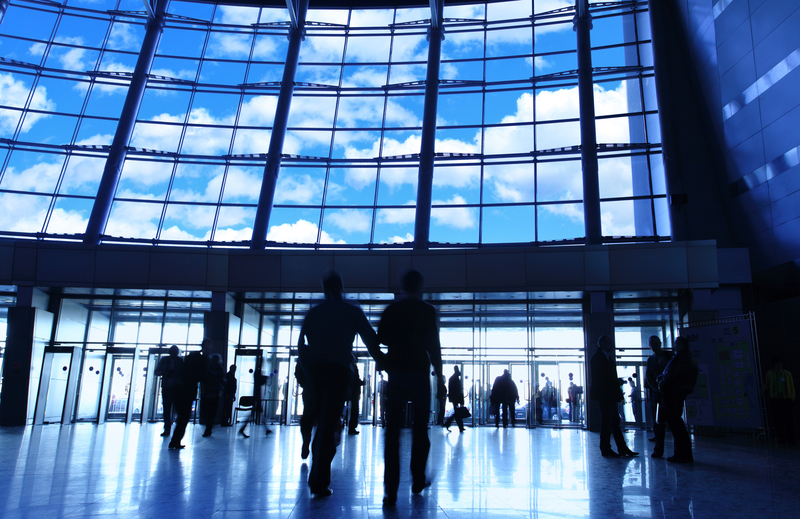 CIOs need to be just as strong at strategic planning and execution as they are at technology. Many are quickly prioritizing analytics, cloud and mobile strategies to stay in step with their rapidly changing customer bases. This is especially true for those companies with less than $1B in sales, as analytics, cloud computing and mobility can be combined to compete very effectively against their much bigger rivals. Gartner’s annual survey of CIOs includes 2,300 respondents located in 44 countries, competing in all major industries. 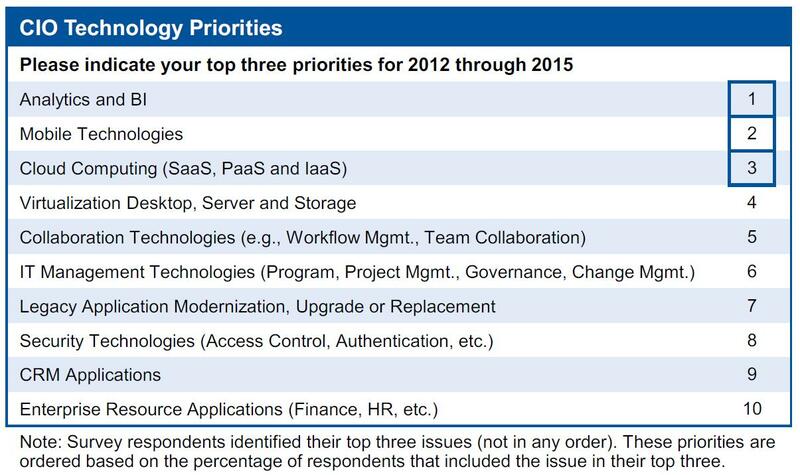 As of the last annual survey, the three-highest rated priorities for investment from 2012 to 2015 included Analytics and Business Intelligence (BI), Mobile Technologies and Cloud Computing. When these priorities are analyzed across eight key industries, patterns emerge showing how the communications, media and services (CMS) and manufacturing industries have the highest immediate growth potential for mobility (Next 2 years). In Big Data/BI, Financial Services is projected to be the fastest-developing industry and in Cloud computing, CMS and Government. 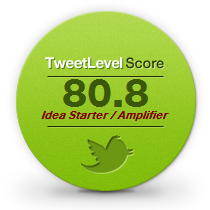 In analyzing this and related data, a profile of early adopter enterprises emerges. These are companies who are based on knowledge-intensive business models, have created and excel at running virtual organization structures, rely on mobility to connect with and build relationships with customers, and have deep analytics expertise. 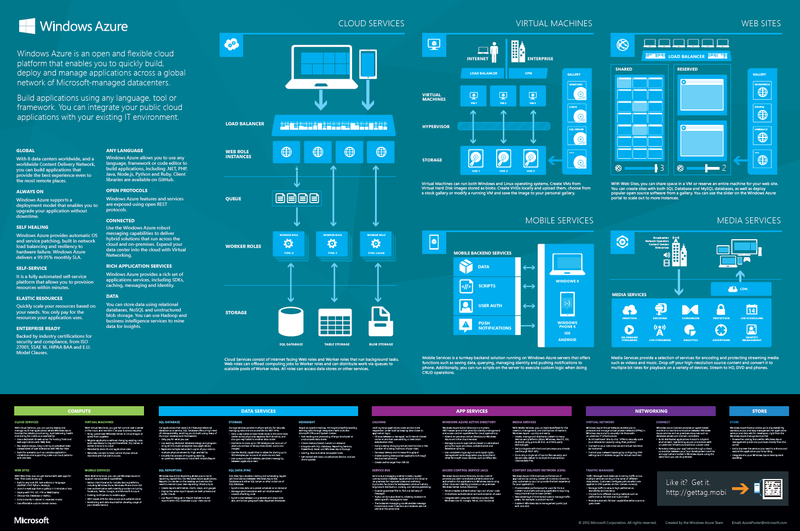 In short, their business models take the best of what mobility, Big Data/BI and cloud computing have to offer and align it to their strategic plans and programs. 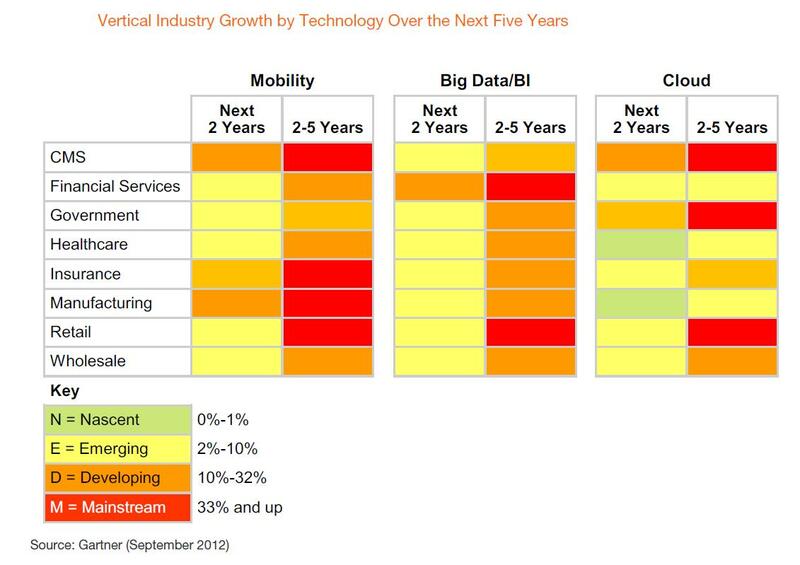 The following figure, Vertical Industry Growth by Technology Over the Next Five Years, shows the prioritization and relative growth by industry. Bring Your Own Device (BYOD), the rapid ascent of enterprise application stores, and the high expectations customers have of continual mobile app usability and performance improvements are just three of many factors driving mobility growth. Just as significant is the success many mid-tier companies are having in competing with their larger, more globally known rivals using mobile-based Customer Relationship Management (CRM), warranty management, service and spare parts procurement strategies. What smaller competitors lack in breadth they are more than making up for in speed and responsiveness. 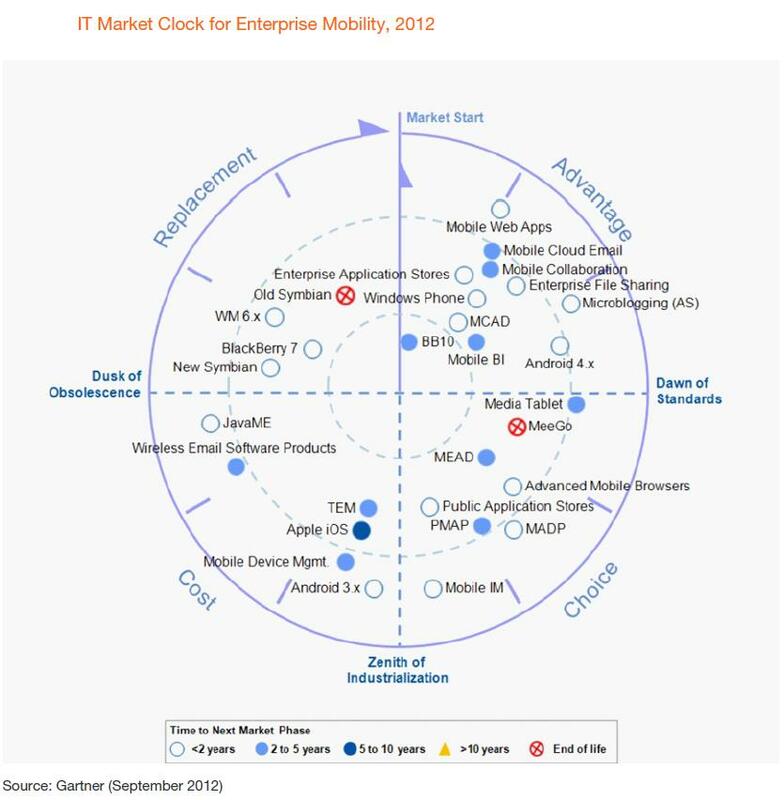 Gartner’s IT Market Clock for Enterprise Mobility, 2012 captures how mobility is changing the nature of competition. Bottom Line – By excelling at the orchestration of analytics, cloud and mobile, enterprises can differentiate where it matters most – by delivering an excellent customer experience. Mobility can emerge as an enterprise Trojan Horse because it unleashes accuracy, precision and speed into customer-facing processes that larger, complacent competitors may have overlooked. Google’s top advertising customers are pushing for convergence of mobile and video quickly, which is turning into a strong catalyst of growth of the global mobile video market. With their largest advertising customers wanting greater flexibility in bringing video to mobile devices, Google will make significant strides this year to make that happen. During their latest earnings call, Google execs said that Android, Chrome and YouTube are the highest priority areas of their business. I’ve been following the last year of earnings calls closely, and it’s clear that Google’s largest advertising customers are pushing the company to bring video to mobile at a level of performance and usability not accomplished yet. The Q2, 2012 earnings call transcript makes this point clear which can be accessed here Google’s Management Discusses Q2 2012 Results – Earnings Call Transcript. The call continued with the points made of Danish advertisers shifting their television advertising dollars to YouTube and other Google branding solutions. Additional companies mentioned on the call using YouTube-based advertising include Denon, Shire, and Intel. Clearly these companies have major product introductions coming up and see mobile video as perfect for reaching more potential customers than ever before. Create Application Programmer Interfaces (APIs) and easy-to-use programming tools for quickly creating mobile-optimized sites. As Gartner studies have shown, video on telephones is most often used as a time-filler, with a median length of 2 minutes, 46 seconds. YouTube will need to support more optimized mobile-based video browsers that can support contextual search. This will be a core requirement for the enterprise, specifically in the areas of mobile customer care, mobile commerce and mobile health. More extensive analytics in YouTube than are available today, specifically tying into to major marketing strategies including product introductions. It is becoming common knowledge that videos improve viewer engagement and prospects attribute a more positive shopping experience when they are used. Luxury brands are investing heavily in this technology including BMW, Burberry, Channel, Louis Vuitton and many others. A Google/Ipsos OTX MediaCT smartphone users study completed in April, 2011 shows that 77% of smartphone users said that their most visited site was a mobile search engine. The size of the worldwide mobile video market was comprised of 429 million mobile video users in 2011, projected to grow exponentially to 2.4 billion users by 2016. Smartphones and tablet sales will contribute 440 million new mobile video users during the forecast period. These market estimates are from the recently published Gartner report, Market Trends: Worldwide, the State of Mobile Video, 2012. Allot Communication’s reports that mobile streaming grew 93% in the first half of 2011; Allot also reports that the usage of YouTube’s mobile channel grew by 152% and YouTube generated 22% of all mobile video traffic in the first half of 2011. YouTube reports getting 400 million video views a month globally. Gartner reports from a survey completed in the 4th quarter of 2010 that 32% of mobile enterprise users watch short videos from YouTube and other sites optimized for video streaming. The fastest growth for mobile video will be in Latin America as smartphone adoption continues to accelerate, replacing traditional cell phones in these markets. Asia/Pacific will have the highest number of mobile video users at 541 million by 2016. Both of these markets will benefit from low-cost smartphones being produced by contract manufacturers who are becoming the dominant production strategy of brand leaders globally. 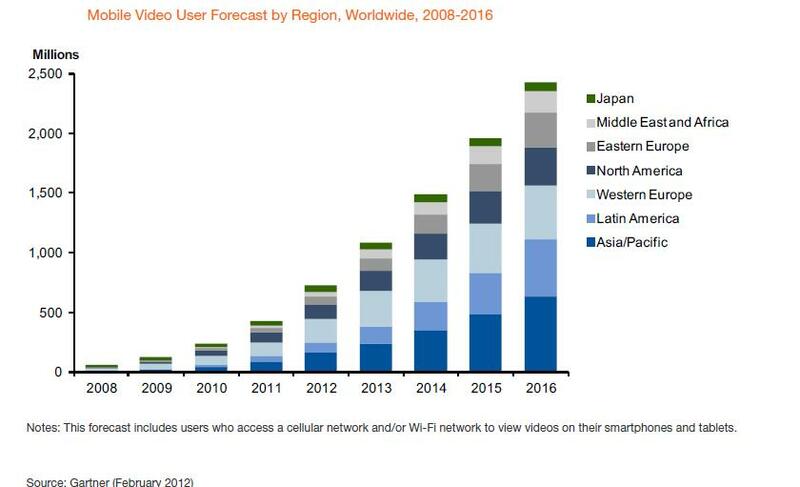 The following graphic shows the Mobile Video User Forecast by Region, Worldwide, 2008 – 2016. By 2016, close to 60% of professionally developed mobile video content will be delivered via mobile-optimized websites that also have enhanced contextual search functionality included in the content management systems. Mobile customer care, mobile commerce and mobile health will be the three primary industry drivers in the near-term of mobile video market, emerging as growth catalysts of this emerging market. Cisco’s Visual Networking Index study reports that last year, mobile video accounted for 56% of all mobile data traffic. 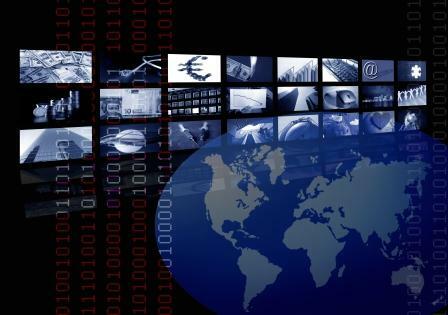 3G/4G connections are emerging as a powerful catalyst of mobile video growth. 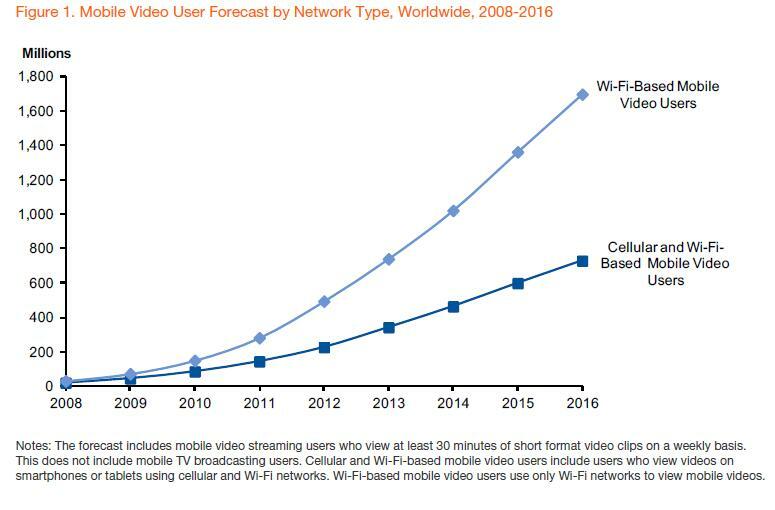 Gartner is forecasting that the worldwide share of mobile video connections on 3G/4G will increase from 18% in 2011 to 43% in 2015. In more established markets incouding North America and Western Europe, the percentage of 3G/4G connections is expected to be as high as 80% and 96% respectively. Gartner projects that 70% of mobile video users will use only Wi-Fi to view mobile video, with the remainder of the market relying on a mix of cellular and Wi-Fi networks to gain access and also upload content. The following figure shows the Mobile Video User Forecast by Network Type, Worldwide, 2008 – 2016.